In Taiwan, pork matters. It’s a fixture in the island’s culinary delicacies and its legendary night market snacks. Now, its government is aggressively bolstering border security to protect the spread of African swine fever into Taiwan as China struggles to halt outbreaks of the virus. Taiwan recently raised fines on individuals for bringing Chinese pork into Taiwan to NT$200,000 (US$6,485) for first-time offenders. Customs officials are reporting cases of contraband meat seizures almost daily. But Taiwan’s ruling Democratic Progressive Party (DPP) says Chinese officials are not proactively sharing information with the relevant bureaus in Taipei, while Beijing has criticized the DPP response to the virus. The Taiwanese response to the disease has become a topic of fierce debate in a country where cross-strait relations, public health, and pork are all political affairs. African swine fever, a deadly virus which spreads among pigs through direct or indirect contact (such as persisting in food waste used as pig feed), has struck 23 provinces in China and led to the culling of over 630,000 pigs, according to the South China Morning Post, citing the state-run China News Service. The disease has not spread to Taiwan’s pig population, although it has been found in pork brought to Taiwan from China, which is the world’s largest pork producer. There is no vaccine against the virus, which does not sicken humans, although doctors fear that future mutations may do so. Taiwan’s Mainland Affairs Council (MAC), which manages relations with China, recently criticized the Chinese government for failing to manage the African swine fever outbreak. MAC minister Chen Ming-tong said last week the Chinese side had not responded to multiple requests to hold bilateral talks on combating the disease. “This demonstrates China’s mismanagement of the infectious disease, which has forced Taiwan to step up its management and inspection,” Chen said at a Dec. 17 legislative hearing. Li Tui-chih, deputy head of Taiwan’s Council of Agriculture (COA), said on December 26 that the agency has made five formal requests to Beijing for updates on the spread of the disease, but has received no response. Chinese residents have claimed that Beijing has failed to inform the populace of the financial risks of bringing meat into Taiwan, according to a December 24 report by Taiwan’s Central News Agency. While airlines flying from China to Taiwan make announcements during check-in and prior to landing, many Chinese visitors have been shocked upon receiving fines at Taiwanese customs. However, Beijing insists it is successfully containing African swine fever. According to China’s state-run Xinhua news agency, Chinese government spokesman Ma Xiaoguang sharply rebutted DPP claims that the virus is out of control as “sheer, intentional hype” at a December 26 press conference. Ma also insisted that China has cooperated with international organizations and received recognition from the United Nations Food and Agriculture Organization (FAO) for its containment of the outbreak. Taiwan is not a member of the UN, and its representatives have been asked to leave FAO conferences in the past. Taiwanese officials slammed Ma’s remarks, with the COA’s Li saying they were meant to “confuse public opinion.” However, Ma said at the press conference Beijing was not obliged to share information on the virus as Taiwan does not import Chinese pork, according to Focus Taiwan, the English-language arm of Taiwan’s CNA. But Taiwan’s response has also found its critics within the country. Some legislators from the opposition Kuomintang (KMT) criticized the government’s decision to send an alert about the disease to all residents on December 12 using an emergency text message system that had been used for disaster response in the past. The COA also stressed to Taiwanese that the country’s pork remains safe for consumption amid false rumors of African swine fever being discovered in Taiwan and continuous reports of airline passengers being fined up to a maximum of NT$1 million for repeat offenders. Pork and politics have long been intertwined in Taiwan. In 2016, pig farmers protested government plans to allow pork imports from the United States containing ractopamine, a feed additive banned in most countries including China and the European Union. At the time, the United States said Taiwan must lift its ban on imports containing traces of the drug in order to join the Trans-Pacific Partnership. 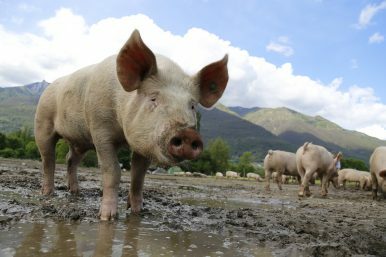 In 1997, an outbreak of animal-borne foot-and-mouth disease (FMD) devastated pig herds in Taiwan, shattering the island’s domestic pork industry. It was declared FMD-free in 2003, only for the disease to return in 2009. The World Organization for Animal Health (OIE) recognized all regions of Taiwan as FMD-free in May 2018. Now, in a society where the surge of disinformation regarding public health through closed social media channels is its own epidemic, Taiwanese officials are left managing rapidly spreading fears that history may repeat itself. Thanks to Chinese diplomatic pressure, Taiwan is left with only 19 diplomatic allies now.